Is It Time To Buy A Home On The Golf Course? I was recently asked whether or not it was the right time to buy a home on the golf course. Of course, my answer was "which one?" As you will see, when buying a home in a golf course community, you have to have a game plan. Before you go shopping for a home on a golf course, I would recommend you establish priorities. How important is golf to you? Do you want to play a lot? How well do you play (do you have an established handicap)? Are you a good athlete and expect to be competitive and improve? You see, the reason that I ask is that no two golf course communities are alike, and you should have an understanding of "what you get" for where you buy. 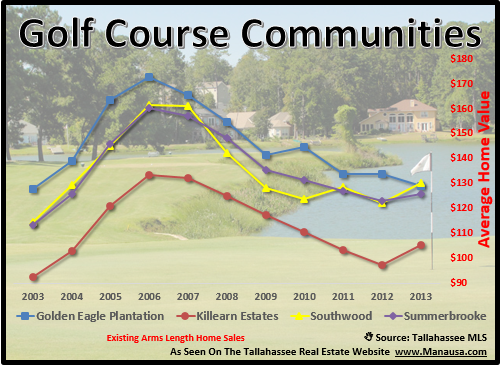 Most neighborhoods in Tallahassee are not nearly as thematic as one that is built on a golf course, so prudent buyers should shop courses and neighborhoods long before they look at houses. Having been a bit of a golf addict in the past, I can tell you that if golf will be a major factor in your off-time, you should take the time to play each course a few times before you decide. There are four primary golf course communities in Tallahassee, and they provide for very different experiences when you play. But they also have different value structures, as our real estate graph below indicates. When we measure price per square foot of existing home sales (resales) over time, we see above value structure for each community. Three out of the four golf course communities are seeing home values on the rise, while just Golden Eagle Plantation is still seeing home values decline. I believe this is largely due to the fact that so many homes were built at a very high price point in such a short period of time in Golden Eagle. Contrast that with Southwood and Killearn Estates which have many homes "not near the golf course." But I also believe this means that some of the best value opportunities are lurking in Golden Eagle, and I do not believe we will see this downward trend last forever. If you would like help buying a home on the golf course, simply drop me a note and we can schedule a time to help you decide where and when to make your move.